Jeremy Clements Racing to Honor Family and A.J. Foyt at Darlington. Spartanburg, SC – Jeremy Clements Racing is excited to announce their throwback car for Darlington, A.J. 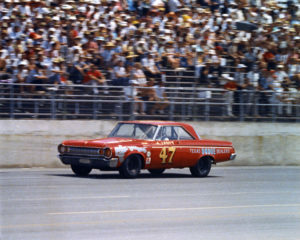 Foyt’s (SuperTex) 1964 Daytona Firecracker 400 winner. 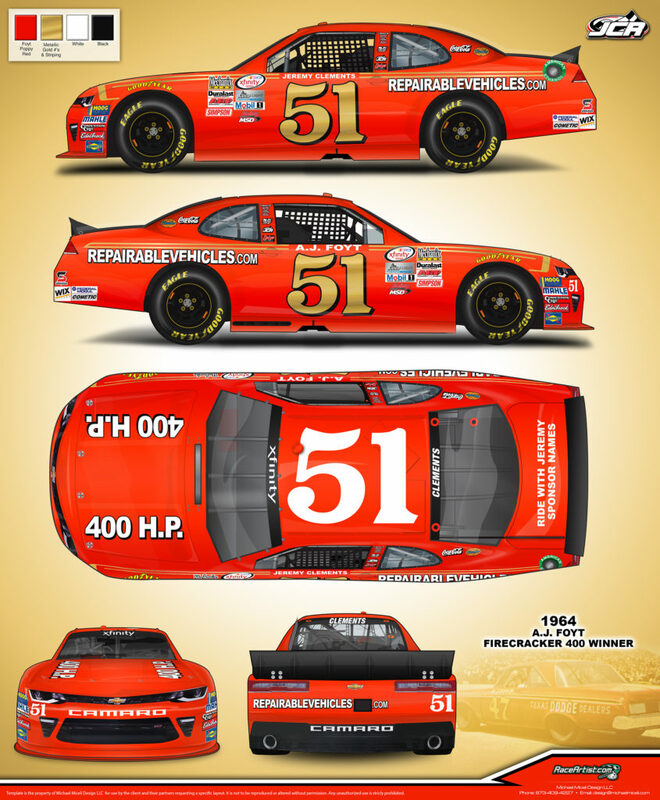 Www.RepairableVehicles.com will power the #51 Camaro SS to honor not only Foyt but, also Jeremy’s Grandfather Crawford Clements. This car holds significant NASCAR history as Foyt recorded his first NASCAR Cup win in 1964 at Daytona. A little over a month after winning the Indy 500 for the second time and Crawford was his crew chief for this historic win in the Firecracker 400. A.J. went on to win six more races in NASCAR plus also drove the #51 car from 1977 to 1982 in Cup. Crawford was crew chief three times in his career: 1961 with Junior Johnson, 1963 with Buck Baker and Foyt in 1964 all wins. “It’s really cool that we are honoring my Grandfather again this year but also driving the colors of racing legend A.J. just makes it even better,” said Clements. “My Grandfather got me started racing just like A.J.’s father, whose name was Tony too, I can’t wait to get to Darlington Labor Day weekend and have just as much success or more as we did last year with Black Widow,” added Clements. This is the third year that Darlington will hold NASCAR throwback weekend. Jeremy will make his seventh career start at the famed raceway where he recorded an eighth place last year his career best at Darlington. Fans are welcome to join JCR again this year with our #RideWithJeremy Fan car. Please see Jeremy Clements Racing on Facebook or www.jeremyclements51.com for more details.